The second most prevalent form of dementia has effective symptomatic treatments available. Both LBD and Parkinson’s disease dementia (PDD) are synucleinopathies in which α-synuclein aggregate-containing Lewy bodies are found. Approximately 1.4 million individuals in the US are affected. Clinically, whether dementia comes before motor symptoms or soon after (ie, within 1 year) is what distinguishes LBD from PDD, in which the motor symptoms come first. Onset occurs from age 50 to 80. Typically, patients with LBD present with cognitive decline with little to no memory impairment and visuospatial processing difficulties, visual hallucinations, autonomic findings, parkinsonian motor fluctuations, or REM sleep behavior disorder (ie, acting out dreams while still asleep). Parkinsonian symptoms can often be subtle and may have to be elicited by the clinician or may not be present. Fluctuating delirium-like symptoms are more prevalent in LBD; it is not uncommon for a patient with LBD to have been treated emergently with haloperidol or risperidone for symptoms of delirium only to have their motor symptoms worsen markedly, even to the point of patients being institutionalized unnecessarily. The visual hallucinations of LBD are typically brightly colored, nonthreatening visions of people or animals. Some patients with LBD also see red or black figures. Threatening hallucinations or delusions of persecution can occur but are much less frequent. When patients are told that the hallucinations aren’t real, they often concur and then go on to ask questions about the hallucinatory figures. Figure. 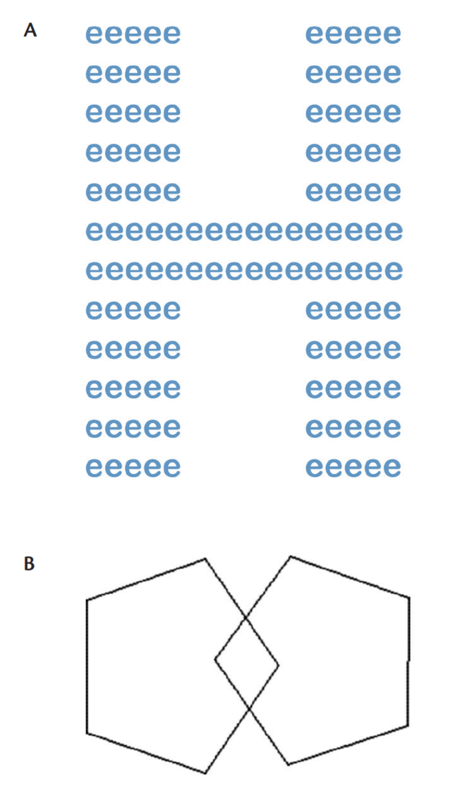 Viewing a Navon figure (A), patients with impaired processing will see only the letter e in this image, and not the larger H composed of the lower case e. When asked to draw intersecting pentagrams (B), patients with Lewy body dementia (LBD) have greater deficits than patients with other types of dementia. In the office, the presence of visuospatial deficits can be assessed with intersecting pentagrams, Navon figures, and clock drawing (Figure). Brain MRI may be helpful because cortical atrophy is an unexpected finding in LBD that is present in other dementias. When atrophy does occur in patients with LBD, it is usually in the occipital lobe, which is rarely seen in people with other dementias. Neoplasms, enlarged ventricles indicative of normal pressure hydrocephalus, vascular degeneration, and Creutzfeld-Jacob disease may be ruled out with MRI. Dopamine transporter scans (DaT) can be helpful. When there is no change in dopaminergic innervation of the basal ganglion or striatum, LBD becomes much less likely though not impossible. Although a positive DaT scan may suggest LBD, it does not make the diagnosis because this finding is seen in other dementias, such as progressive supranuclear palsy (PSP), corticobasal degeneration (CBD), or Pick’s disease. 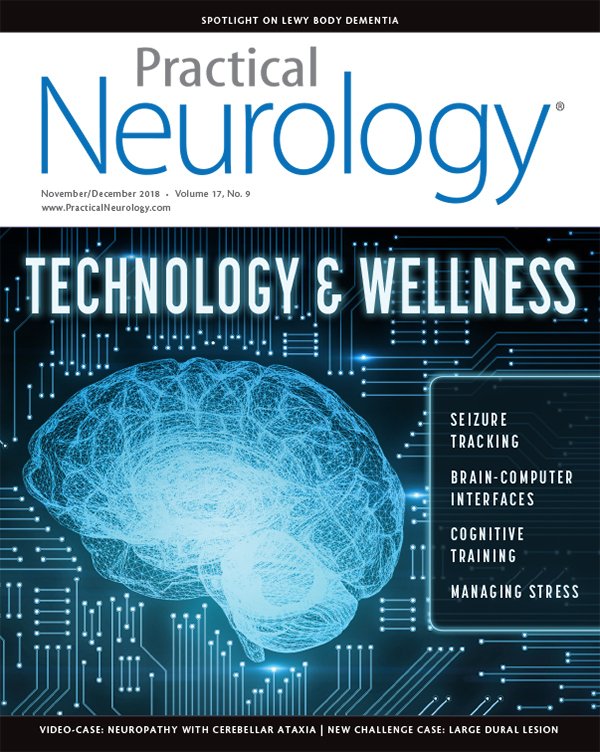 Scanning with fluorodeoxyglucose positron emission tomography (FDG-PET) is not particularly helpful because it does not differentiate people with LBD from those with posterior cortical atrophy.6 Amyloid PET is also not helpful because it does not differentiate patients with Alzheimer’s disease (AD) from those with LBD. The medications that work best for symptomatic treatment of cognitive symptoms and hallucinations are the cholinesterase inhibitors galantamine, donepezil, rivastigmine, or memantine; choosing among these drugs is based upon expected tolerability. These treatments diminish hallucinations and improve cognitive fluctuations and memory. If patients continue to have hallucinations that are not threatening or do not upset the patient, it is preferable not to add antipsychotics. If hallucinations are threatening or delusional, it is of great importance to use antipsychotics that have minimal cognitive or motor side effects, such as clozapine or quetiapine. Clozapine and quetiapine increase the risk of stroke and should be avoided in patients with risk factors for stroke. If REM sleep behavior disorder endangers the patient or their sleeping partner(s), clonazepam or melatonin may be tried. For motor symptoms, levodopa/carbidopa may be used if necessary; however, the side effects of psychotic symptoms limit use. Patients often experience depression or anxiety and at our center, we find that selective norephinephrine reuptake inhibitors (SNRIs) may be more effective than selective serotonin reuptake inhibitors (SSRIs). For apathy, which is very common in these patients, buproprion or amantadine can be helpful. Orthostatic hypotension can be managed with fludrocortisone and hydration; constipation is best managed with bulking agents. Occupational therapy, physical therapy, and speech therapy can be beneficial for maintaining patients’ abilities of daily living, although round-the-clock supervision is usually required. Reminiscence therapy, which includes revisiting pleasant memories with family and friends supported by photographic materials, can be very helpful, and continuing to socialize is important. Lifestyle changes include fall prevention, other safety measures, and not putting enjoyable actives (eg, a cooking class in Tuscany) off to the future. Exercise is beneficial in all neurodegenerative disease, protecting neuronal function and preventing falls by improving core strength and bone density. Natural light, optimal vitamin D intake, proper hydration, and a healthy diet should also be recommended. Current studies suggest the nonreceptor tyrosine kinase c-Abl, being evaluated for treatment of patients with chronic myeloid leukemia, may have benefit for parkinsonian symptoms. There are also ongoing studies of monoclonal antibodies against amyloid, amyloid plaques, and synuclein. It is likely that patients with LBD would need a combination of medications for AD and PD. 1. Vann Jones SA, O’Brien JT. The prevalence and incidence of dementia with Lewy bodies: a systematic review of population and clinical studies. Psychol Med. 2014 Mar;44(4):673-683. 2. Hogan DB, Fiest KM, Roberts JI, et al. The prevalence and incidence of dementia with Lewy bodies: a systematic review. Can J Neurol Sci. 2016;43(S1):S83-95. 3. Possin KL. Visual spatial cognition in neurodegenerative disease. Neurocase. 2010;16(6):466-487. 4. Ala TA, Hughes LF, Kyrouac GA, Ghobrial MW, Elble RJ. Pentagon copying is more impaired in dementia with Lewy bodies than in Alzheimer’s disease. J Neurol, Neurosurg Psych. 2001;70:483-488. 5. Oda H, Yamamoto Y, Maeda K. The neuropsychological profile in dementia with Lewy bodies and Alzheimer’s disease. Int J Geriatr Psychiatry. 2009;24(2):125-131. 6. Whitwell JL, Graff-Radford J, Singh TD, et al. 18F-FDG PET in posterior cortical atrophy and dementia with Lewy bodies. J Nucl Med. 2017;58(4):632-638. 7. Gomperts SN. 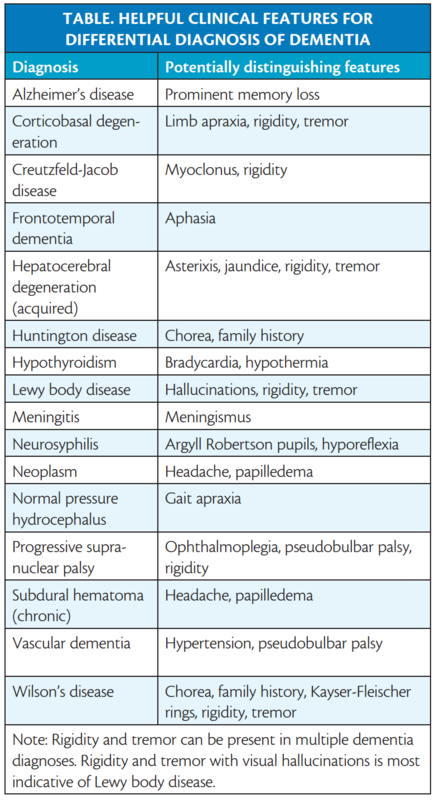 Lewy body dementias: dementia with lewy bodies and Parkinson disease dementia. Continuum (Minneap Minn). 2016;22(2): 435-463. AS has no financial or other relationships relevant to this content to disclose.